How many hairs do sea otters have per square inch of their bodies? How many pounds of food would a 45 pound sea otter need to eat each day? How many sea otters are estimated to have lived along California’s coast before they were hunted for their fur? Which food in a sea otter’s diet can stain its teeth? Which of the following animals is the closest relative of a sea otter? Sea otters have the thickest fur of any mammal, and that fur is essential to their survival. Sea otters lack blubber, the thick layer of fat that keeps seals and sea lions warm. Instead, their thick fur traps air against their bodies, which helps insulate them against the cold water. Sea otters were once hunted almost to extinction for these thick, soft, pelts. They were so scarce by the early 1900s that they were thought to be extinct along the California Coast. However, one small group of otters survived along the coast of Big Sur; this group was first sighted in the 1930s. The otters that you see in Morro Bay today are descended from this population. Sea otters need to eat 25% of their body weight each day in order to stay healthy. While they often look like they’re lounging or playing, sea otters are actually working hard just to survive. Much of their play-like behavior—rolling over, rubbing and fluffing their fur—is necessary to keep them buoyant and warm. If they aren’t grooming or sleeping, they’re likely to be hunting. All of this activity burns a lot of calories that the otters must replace. This is especially true of mother sea otters (sometimes called sows), who hunt for themselves and their pups. The caloric demand is so great for mother sea otters that they can raise only one baby at a time. You can help these mothers and babies out by observing them from a distance. This way, rather than worrying about a possible threat and missing out on a chance to catch her next meal, the mother otter can spend her precious energy keeping herself and her baby fed and groomed. While California’s sea otter population is still much smaller than its historical size, the California sea otter census from spring of 2018 found 3,128 otters along the coast. While this is a decrease of 58 otters from the year before, the population is relatively stable, having hovered right around 3,000 since 2016. 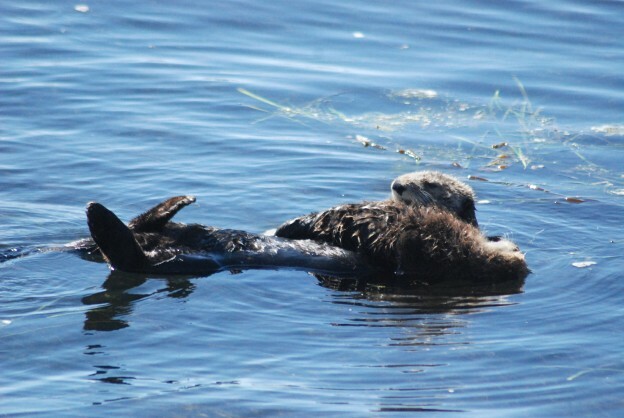 The full version of the California Sea Otter Census for 2018 contains detailed population information. This success is due, in part, to their protection as threatened under the Endangered Species Act in 1977, their numbers have begun to rise. Sea otters are also covered by the Marine Mammal Mammal protection act. Protections like these, along with an increased understanding of what sea otters need to survive and thrive, has helped them make this recovery. In Morro Bay, 53 sea otters were counted inside of the Morro Bay estuary. That’s an increase over the past two years. Which food in a sea otter’s diet can stain its teeth? Answer: sea urchins stain sea otters’ teeth purple. Purple sea urchins have a pigment called echinochrome that sea otters’ ingest when they eat these spiny invertebrates. Over time, the pigment can stain sea otters’ teeth, and even their bones, purple. Biologically, sea otters are more closely related to weasels than to the other animals on this list. 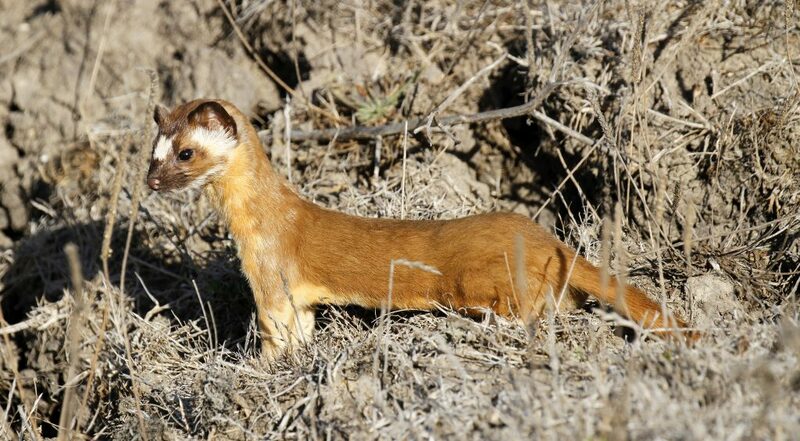 This long-tailed weasel is a closer relative of sea otters than either dogs or sea lions. Photograph courtesy of Robin Agarwal via Flickr Creative Commons License. All of these animals eat meat and are classified in the taxonomic system as caniform carnivores (as opposed to feliform carnivores, which is the suborder that cats belong to). However, only weasels and sea otters are in the Mustilidae family. Dogs belong to the Canidae family and sea lions belong to the Otariidae family. To report stranded or dead otters: If you see a struggling, stranded, or dead sea otter, please call the Marine Mammal Center at (415) 289-SEAL (or 7325). They will help the animal, if possible. They also work with researchers who study the causes of death and disease in sea otters in order to better understand the threats these animals face. 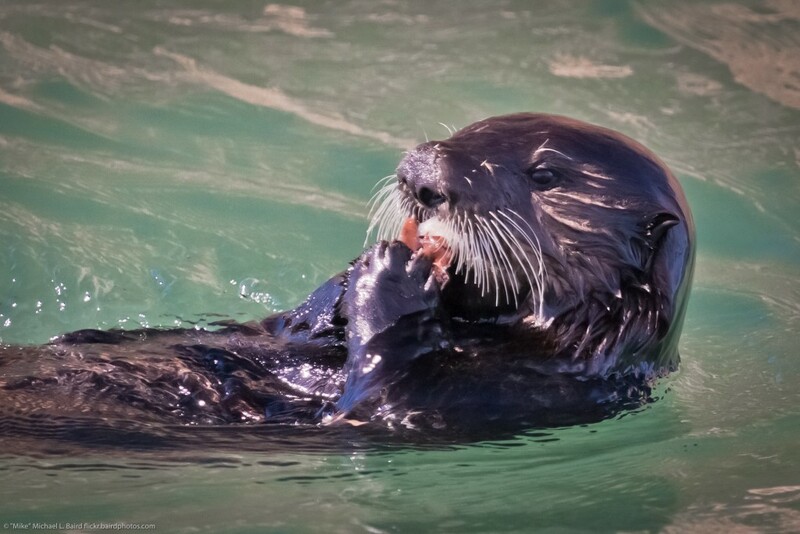 Curious about the history of sea otters and their past and current ranges? Visit otterproject.org’s Natural History page.